A OO model railway layout by Thistle Modelmakers Model Railway Club. Set Somewhere in the Scottish borders near Carlisle lies the town of St Cuthberts. It is the late 1950s and no one has heard of anyone called Dr Beeching. The town is served by a small station with a regular passenger service and much of the local goods for shops and farms arrive and depart by rail. Everything seems right and there isn’t a cloud on the horizon. 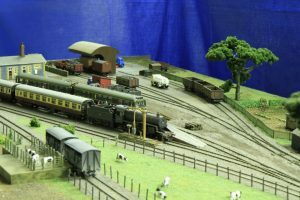 The layout operates with a mixture of LMS steam and diesel motive power. 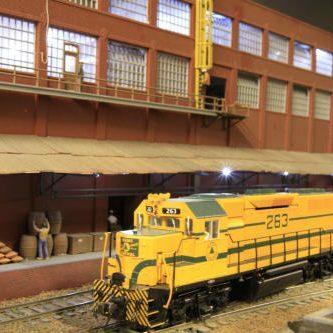 It consists of 2 scenic boards and a fiddle yard. The layout is operated from the rear with a low backscene enables spectators to ask questions. 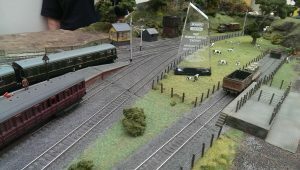 This is a OO model railway layout that uses DCC to control it. An LMS “crab” 2-6-0 waits to depart with a train to an unspecified location – next stop Newton St Boswells perhaps?